Creamy and sweet, lemon panna cotta with raspberry sauce is a light, creamy, easy dessert that you can make ahead, refrigerate, then serve when you’re ready for dessert. Panna cotta (Italian for cooked cream) is just that. It’s cream cooked with sugar, gelatin and any flavoring you choose. It is then refrigerated in moulds and allowed to set, dessert done! For this panna cotta I chose to flavor with lemon because I’m ready for Spring. Panna cotta is not just a spring/summer desserts, I’ve made one for Christmas too, that looks very festive, pomegranate panna cotta. I layered pomegranate jello with orange infused panna cotta in small shot glasses. This is one of my favorite ways to present it because it looks so stunning, take a look here > pomegranate panna cotta. 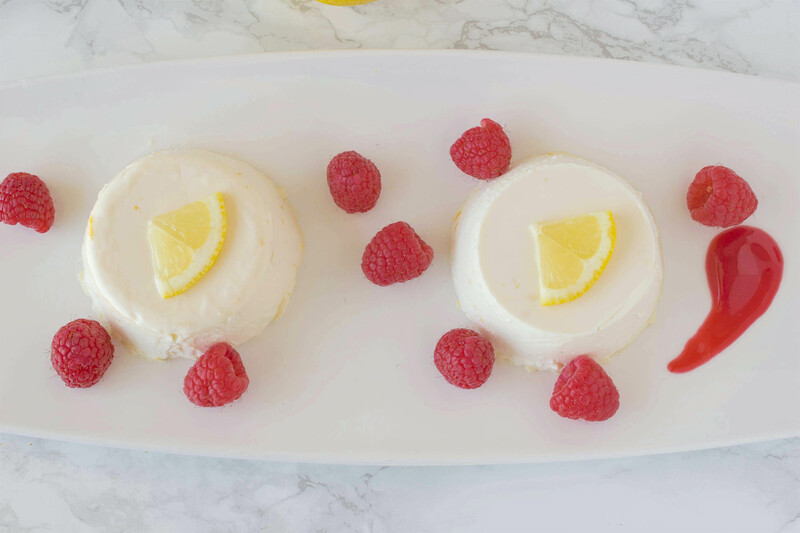 This lemon dessert is just 1 of 11 lemon recipes I’m bringing you today because I’m taking part in a 30 day lemon challenge with some fellow bloggers. You can find all of their delicious recipe links below. 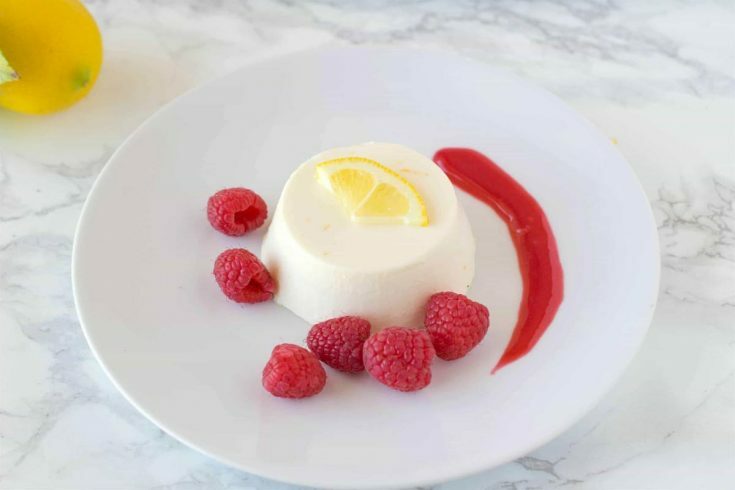 Creamy and sweet, lemon panna cotta with raspberry sauce is an easy dessert that you can make ahead, refrigerate, then serve when you're ready for dessert. Place 4 - 4 ounce ramekins onto a plate or small baking sheet. To a saucepan add the cream and sugar over medium heat, bring to a simmer and stir until sugar is dissolved. Whisk in the gelatin until dissolved. Stir in the lemon zest, juice and simmer for 5 minutes until starts to thicken. Turn off the heat and stir in the vanilla. Divide the cream mixture between ramekins and refrigerate at least 4 hours to overnight. Cook for 5 minutes until the berries start to break down. Strain through a sieve into a container with a lid and refrigerate until chilled. Once the panna cotta is set, dip the bowls in hot water to help loosen, then run a knife around the edge. Invert onto a plate and top with the raspberry sauce and fresh raspberries. Put the mold upside down on a plate and release the panna cotta. Serve with fresh raspberries and the raspberry sauce. This dessert looks really elegant and love that you paired it with raspberry sauce! A simple, beautiful and light dessert. I just LOVE panna cotta, this look so pretty and I’m sure it tastes amazing! What an elegant dessert and great use of Lemon! Yum! I love all things lemon. So excited to try the panna cotta, I have never made one before but it looks very doable. This lemon challenge sounds like fun! 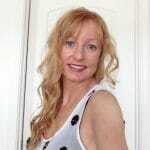 Love the panna cotta! Pinned! Absolutely gorgeous! I really love this dessert. One of the best out there! 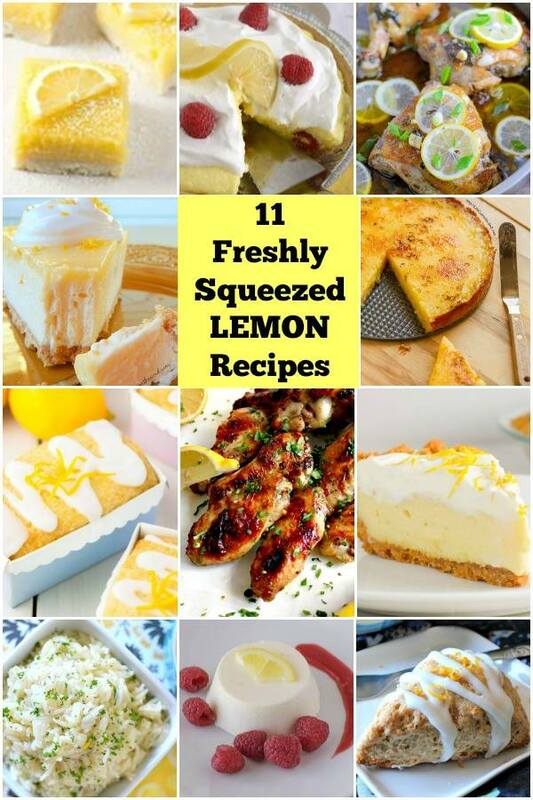 I love the round up of lemon recipes from the other bloggers too. A great variety to choose from! Almost too pretty to eat, but I’d sure try! Love the addition of some juicy raspberries too! What a gorgeous dessert and photos! I can’t wait to make it! Panna Cotta is one of my favorite desserts, but I’ve never tried making it! Yours looks amazing and makes me want to attempt making it asap! 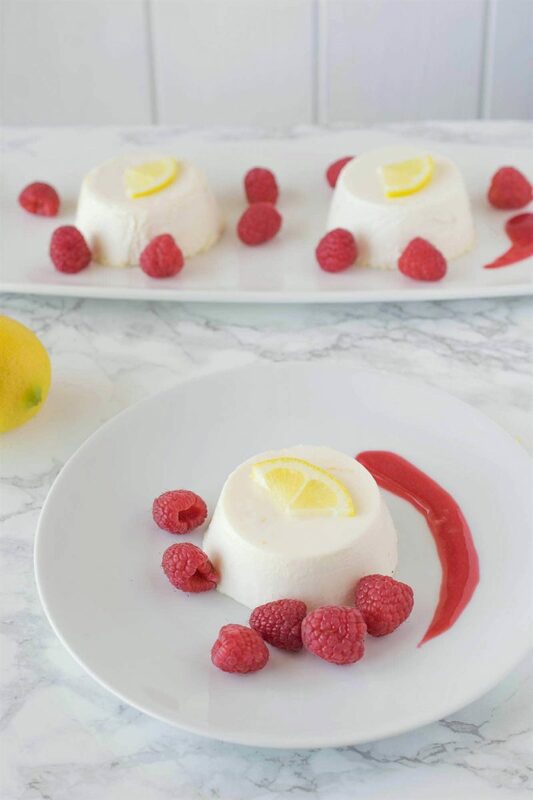 I love the combination of lemon and raspberry and this panna cotta sounds amazing! You always make the prettiest of dishes, I adore this!! It is also so perfect for spring and would be a great dessert for a dinner party, impressive! !